Painting the interior or exterior of a hotel requires a combination of painting skills and experience. While you may think you can hire any interior or exterior painter to get the job done, it’s important that you take your time to research commercial painting companies and only invest in those who offer expert hotel painting services. Whether you own or manage just one hotel or an entire hotel chain, professional hotel painters will give your building a flawless finish that impresses every guest. Follow the Right Blueprints & Specs: Your hotel painting team shouldn’t start your project until you both agree on specifications, blueprints, and paint colors. Use Only Low-VOC Paints: Low-VOC paints are essential to ensure that gases released from drying paint isn’t harmful to guests, your staff, or painters. Be EPA Lead Certified: A quality hotel painting company should be an Environmental Protection Agency Lead-Safe Certified firm so you know that your guests, your business, and your staff are protected during the painting process. Professional Painting Equipment: Your painters should exercise a safety-first mentality by using only professional painting equipment (e.g. lifts, paint sprayers, large rollers) to ensure your painting project is completed safely and on time. Properly Prepare Surfaces for Painting: Preparation is key to a beautiful, long-lasting paint job. You will know you are hiring the right hotel painters if they properly prep interior or exterior walls before painting. Power washing, sanding, wood repair, drywall repair, masonry repair, and caulking and sealing should all be offered and used whenever warranted. Precision & Speed: As with any commercial painting service, hotel painting requires speed and precision. A top-notch hotel painting company will be willing to work with your schedule including nights and off-season times, plus provide a stealthy painting crew to complete your project perfectly and on time. Protection & Cleanliness: Hotel painters will use every precaution to ensure that your interior floors, furniture, and other items are protected during your painting project. They will use drop cloths and other protective means to keep messes contained and are skilled in maneuvering around overhead fixtures, lighting, and chandeliers. Each day’s work will also receive a thorough clean-up to further minimize disruption of guests and your workflow. Low-Odor Coatings: During and after a painting project, it’s essential to keep “paint smell” as minimal as possible as to not disturb your guests. High-quality hotel painters will offer low-odor coatings for this purpose. A license issued by your state. Current safety certifications including Fall Protection & Aerial Lift Operation. Use proper lifts, scaffolding and ladders to safely reach any height your hotel demands for painting. Multimillion-dollar general liability insurance coverage to protect you, your guests, your staff and your hotel. Ability to offer a bond if needed for your particular project. A warranty that covers both labor and materials provided at the time of your quote. Gives you a detailed, exact quote for your project. The last thing you need is an unwelcome financial surprise once your project has been completed. A great painting company will provide a detailed painting quote and adhere to the budget and timeline perfectly. Won’t take an initial deposit. An honest painting company won’t ask for a deposit up front and instead offer 30- or 60-day terms. They will make sure that you are completely satisfied with the final result and during each draw stage before asking for money. Proudly shares images and references for past painting projects. One of the easiest ways to tell if a hotel painting company is trustworthy is to ask for references and images from past projects. If they are hesitant to share, or don’t have any available, this can mean only one thing: you can’t trust them! Move on to another company if references or before and after images of paint jobs aren’t readily available. 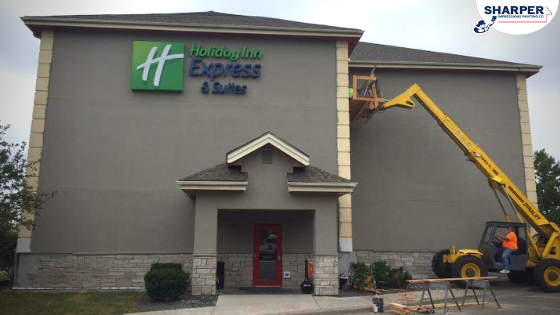 If you’re looking for interior or exterior hotel painting services to maintain or refresh your building’s appearance, look no further than Sharper Impressions. 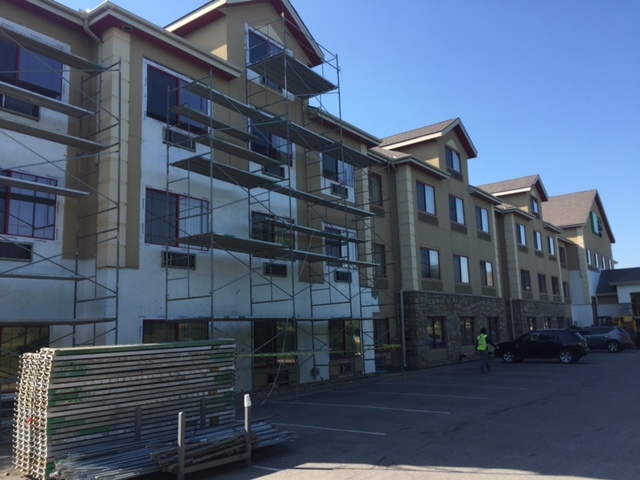 Our painters have over 25 years of experience, capabilities, specialized training and equipment to finish your hotel painting project on time and on budget. Get your free hotel painting quote today! 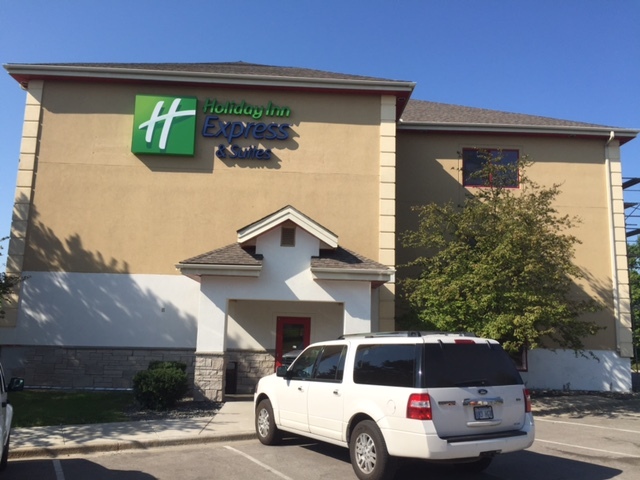 Our professional painters in Kansas City were contacted to take on this exterior hotel painting project for Holiday Inn Express. We handled all of the exterior power washing, prep work, and a final coating of paint. 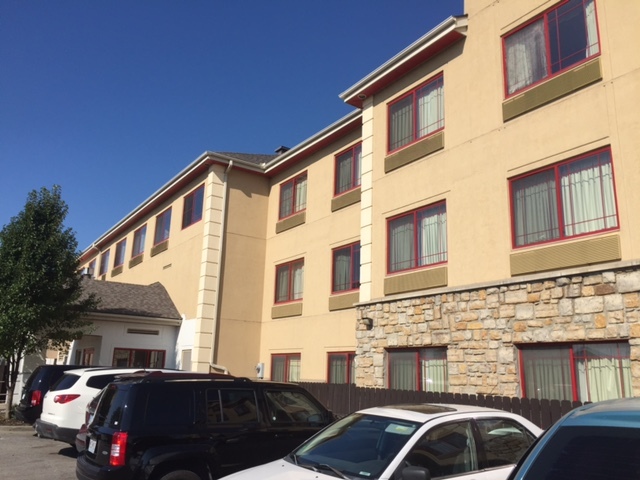 We safely worked on this hotel using a boom lift for a four- to six-week period to complete this multi-level project and coordinated all material purchases to be delivered directly to the site to keep costs down. The project was completed without any delays aside from some minor weather interruptions. We have since gained a customer for life!